Beware of the wimpy shower! For people who love their morning or evening shower, a wimpy spray can ruin their day. Are you someone who loves a strong shower? I, too, hate a wimpy shower. I owned a good shower head, even when I was renting. However, when house-hunters turn on showers to check the pressure, they often do not get the information that they need. Poor water pressure can be caused by the fixture, the plumbing leading to the fixture, the volume of the water coming into the house, or more than one of these. Turning on the shower will not give you the complete answer. It is just a waste of water. 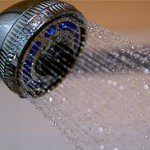 When a house hunter turns on the shower, he or she could get false evidence of wimpiness because the shower head is clogged, while the pressure is fine. If he or she buys the house, cleaning the existing head or buying a new one will fix the problem at minimal expense a bother. He or she may also get false evidence of a wonderful shower because the head is good, but the volume or pressure in the whole house is insufficient. The shower could flow great until someone else turns on a faucet, runs a dishwasher, or flushes a toilet. Water pressure problems show up when there is more than one draw on the system. Turning on the shower alone does not diagnose those problems. 1. Go to the highest bathroom in the house. 2. Turn on the water in the sink full blast. 4. If the water level changes in the sink, the water pressure is average to lower than average. 5. If there is a lower bathroom, do it there. If water pressure is the problem, the pressure will be higher in the downstairs bathroom. When you are doing a full inspection, the inspectors will turn on all the water all over the house, then flush. If the water pressure is bad, the water can go down more than 80% while flushing. I’ve seen it. It’s not pretty. Low water pressure usually results when you’ve been forced to turn on two different plumbing fixtures at the same time, whether they are the outside garden hose, the kitchen/bathroom sink, the toilet, or even the shower. Although your water pressure may be sufficient when only one fixture is operational, you’ll definitely notice a drop in water flow when the second fixture comes into use. • Pressure regulators – These valves are generally where the water enters the house. They need to be set by a professional. • Elevation – Water needs additional push to flow upward, so houses on hills and condos in tall buildings can have low pressure. Town water towers are meant to increase water pressure using gravity. Tall buildings use pumps. 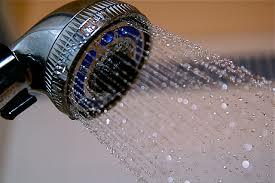 • Home valves – Sometimes shut-off valves are impeding the flow of water in the house. Low water pressure could be caused by accidental moving of a turn-off valve. • Water leaks – If you pressure was good, but has changed, it may indicate a leak in the house or the line to the house. • Peak periods – If you’ve lived in a large apartment or condo building, you probably experienced how water pressure is weak when everyone is using it at the same time. The same thing can happen in a town or neighborhood. • Mineral deposits – not only do shower heads and aerators get sediment in them, the main line coming into the house, if it is iron, will collect sediment over time. (It is like hardening of the arteries in people.) Over the years, that one inch pipe has a quarter inch of space inside for the water to flow. The result is low water volume. The solution is to install a new main water line.